Do you travel a lot? If you do then you may already have a garment bag to carry your things around in but you may not. Getting a garment bag makes it easier to carry your clothes and to make sure that when you arrive wherever it is you’re going you don’t have to worry about how they’re going to look. No one wants to think about ironing when they first arrive on vacation or even when they first arrive for a work trip. 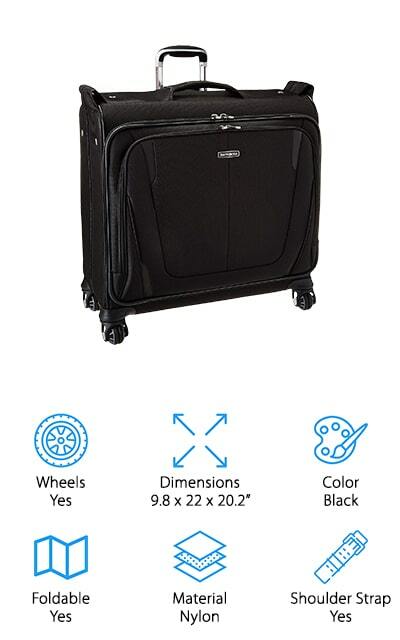 Wheels: Does the garment bag have wheels? If it does you’re going to have a much easier time getting it where you want to go and making sure that you don’t have to actually carry it. Pulling it behind you across the airport is definitely going to be better. Dimensions: How large is the bag? Depending on what you’re going to be packing and just how much you’re packing you want to be sure that the bag will hold everything. You don’t want something too large or too small. Color: What color is the bag? This is all about personal preference but it’s something that you’ll want to consider. No one wants to carry around a bag that they really don’t like the looks of, right? You want something you can really enjoy. Foldable: Does the bag fold down? When you’re heading home after that long vacation and your clothes are dirty anyway do you still need to carry the garment bag or can you fold it up and put it into your regular suitcase? Material: What is the bag actually made of? Leather and polyester are two of the most common but you’ll definitely want to consider the different options. This will reflect the quality, longevity and the way your clothes look. Shoulder Strap: Is there a shoulder strap that makes it easier to carry the bag? If it doesn’t have wheels this is likely something you’ll definitely want. If it does have wheels though this could still be a benefit to make things easier. There are definitely plenty of options out there when it comes to garment bags and making sure you have the one that you’re really looking for is going to be essential. No one wants to spend a ton of time looking for something, even if it’s something you need. That’s why we’ve done the work for you and narrowed down the top ten garment bags for you to check out. Here we have one of the best carry on garment bag options out there. It’s moderately priced and even has wheels and plenty of strap options to make sure you can carry it however you feel the most comfortable. Large enough to hold anything you want to take with you it is fully lined and even features tie-down straps that keep everything in place. The book open design makes it easy to pack and to see everything when you’re looking to get ready and the hanger bracket and interior pockets make sure everything stays organized. 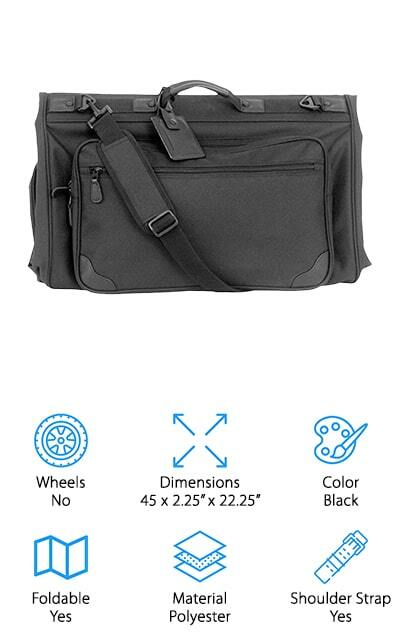 This simple bag is going to be easy enough to wheel around on your way through the airport or anywhere else you need to go and can easily hold suits, shoes, dresses and a whole lot more so you don’t have to worry about wrinkling before you get to your destination. If you’re looking for an inexpensive option that will still keep all of your clothes looking great for travel this is a great way to go. It doesn’t have wheels but it does have a shoulder or hand strap that makes it easy enough to carry. The fact that it’s lightweight and has plenty of pockets throughout the inside and outside allows for plenty of storage and even better organization than you’ll find with many other options. It’s great for keeping your clothes clean and neat without the need for ironing and it has a dual buckle to keep everything in place. Great for both men and women it’s made with rugged polyester and has an interior lining that makes sure you can feel comfortable storing all of your items. It even has a money back guarantee so you can give it a try without having to worry about the risk either. 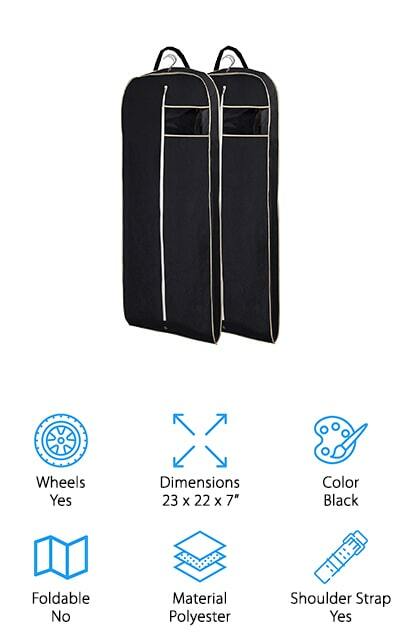 This may not be the best wheeled garment bag but it is the best hanging one you’ll find. It’s a set of 3 bags that come with their own hangers and windows so you can see what’s inside without having to open them up. They’re 60” so they’re just the right size for suits, dresses and long coats or anything else you might need to take along with you. When you’re ready to go you fill them up with all of your clothes and the polyester, anti-moth protector keeps them safe, whether for travel or for storage. When you’re done and don’t need them you can even fold them up and put them away. Designed to keep out dust, debris and more, these bags are lightweight and breathable so your clothes will be ready to wear immediately without concern for wrinkles, mold or anything else. They’re kept ready and you can even fold the bag in half to make it easier to carry and transport. This garment bag is actually inexpensive and provides you with plenty of space for up to 3 full suits with shirts. Even better, it keeps everything organized and ready to go whenever you need it. All you have to do is sort out your clothes and shoes and you’ll be able to skip the ironing you normally need. There are even interior tie-down straps that help keep your clothes still. Because the bag is small you can take it easily on a plane or even on a cruise ship so you always have something great to wear. The shoulder strap makes it easy to carry along, as does the reinforced handle, all of which make it easy to move. The soft edges are even designed to make it simple to put in an overhead compartment. When you’re not using it you just fold the bag and that’s all there is to it. 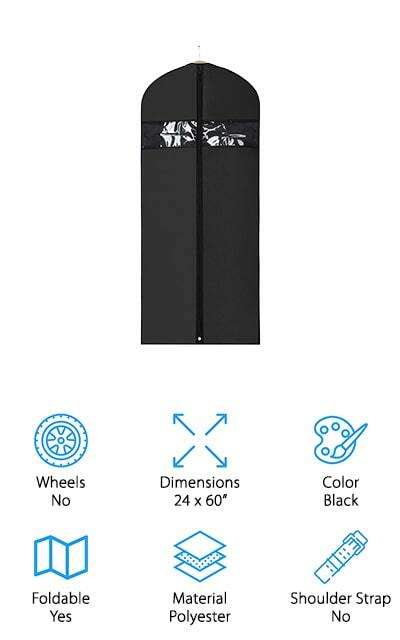 Here is one of the best garment bag for men’s suits currently available. 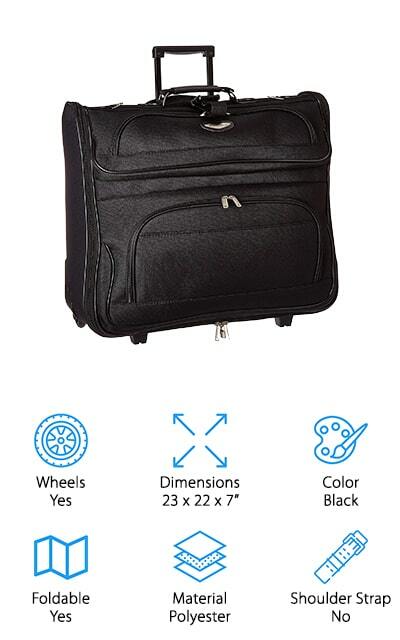 The 24” bag has spinner wheels that make it roll along a whole lot easier while you’re traveling anywhere. It’s also made with water-repellent fabric and has reinforced corners that are made to protect the bag and everything in it. When you’re ready to open it up the book open design makes sure you have space for hangers or can hold it open with hooks over a door. There are pockets included for small items including shoes, belts, ties and more, plus exterior pockets for other items. With this lightweight, black bag you’re going to have all the space you could need and a sleek, elegant way to carry things around. Just pack up all of your clothes and when you arrive at your destination they’ll be ready for your next special event. You’ll find this one to be possibly our best tri-fold garment bag with plenty of space for anything you might need to take along with you. 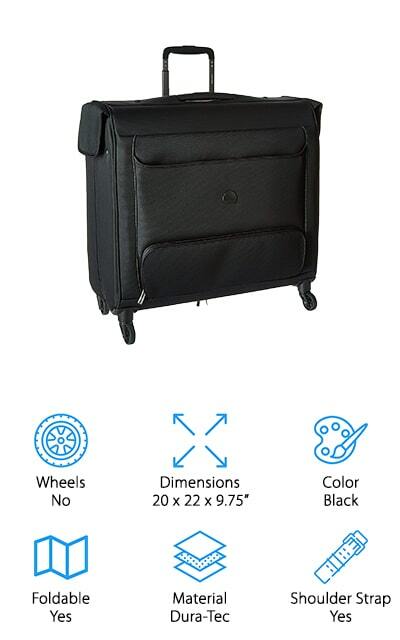 That’s because it’s designed to carry all of your clothes, including suits and dresses. Made from polyester, it’s a durable bag that has solid hardware and zippers. 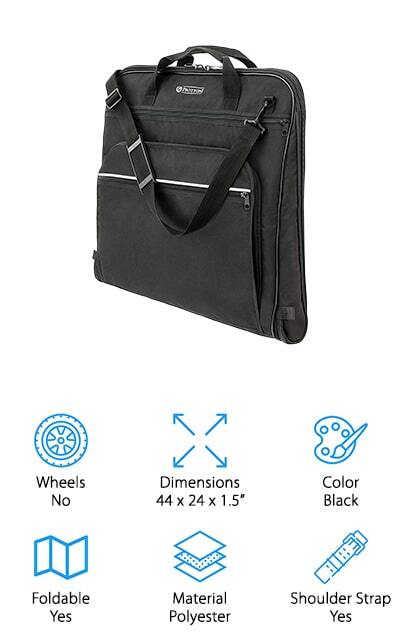 You’ll even have a shoulder strap and luggage tag as well as a handle that makes it easy to carry along wherever you want to go and however you’re most comfortable. When you’re ready to head out on that next trip you just pack up all of your things and strap them down and you’re ready to go. You’ll even have the space to store your shoes and other accessories to make sure you’re prepared for absolutely any occasions. 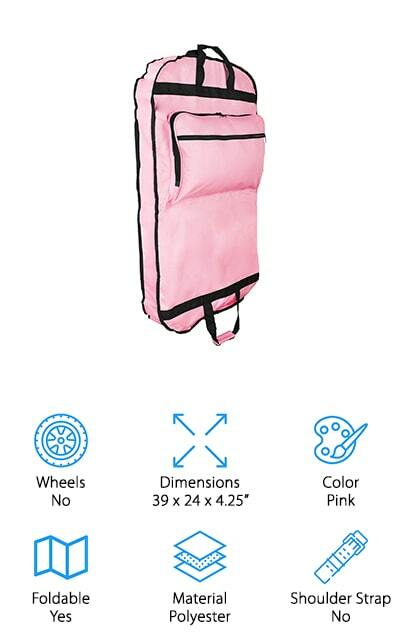 With so many different colors available you’ll definitely be pleased with this best garment bag luggage. It allows you to store anything you might need, from suits and dresses to smaller items like shoes and accessories. The brilliant colors are a lot of fun and allow you to really enjoy your favorite style. They are definitely fun and easy to carry along with you. The bags will fold easily and can be quickly taken along wherever you want to go. All you need is to grab the handles and this polyester bag will be durable and able to stand up against anything. Pink, green, blue, red, orange and a whole lot more are available and you’ll be able to match your own personality to the bag you carry. Just put your items away and you’ll be able to pull them back out quickly and easily when it comes to that special event. 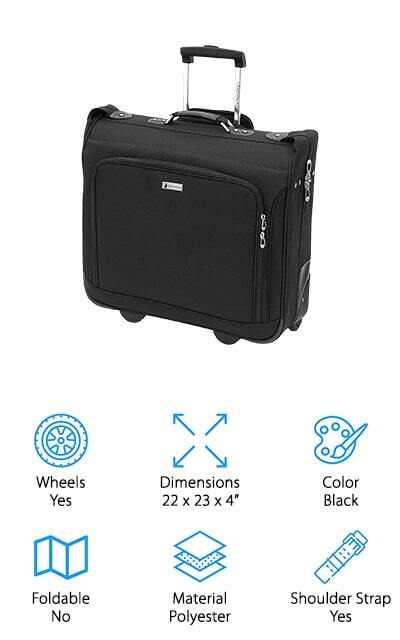 Here we have the best carry on garment bag with wheels. It’s available in four different colors, which means you get to choose your favorite color to showcase your personal style. There’s even a pull handle, a handle and a shoulder strap. That means you can carry it along however you want and you’ll have the protection necessary to keep your gear and your bag safe. It has in-line skate wheels as well as zippered mesh pockets and interior lining. For items inside the bag there are even ties to make sure that all of your items are kept exactly where you put them, safe and secure. The compartments are plenty large enough to hold everything you need for that next trip as well. This one just might be the best garment bag for business travel. It’s a 2 pack that actually provides you with plenty of space to hold a suit or dress or anything else you might want. They each have a carry handle as well as a space for hangers to make sure you can easily hang up anything that you want. You really want to make sure you have space for everything after all. If you’re ready to go you can just fold it up and carry it even easier. Here you’re going to have breathable material that is completely rip resistant and protects your clothes from anything, including dust and more. You’ll be able to head out a whole lot faster than you might have thought and a whole lot easier, with a bag that folds easily when you’re not using it. 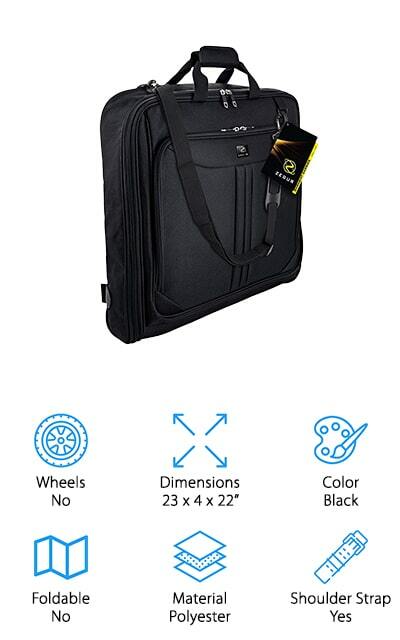 If you’re going to be traveling a lot you want the best garment bag carry on to make sure your clothes stay in great shape. This one comes with multi-directional wheels that spin in all directions to make it easier to steer. It also rolls entirely upright so there’s no added pressure or weight on your arms. When you’re ready to open it up it stands completely upright as well to make sure you can pack anything you need on hangers and more. It also has an extender panel for long items and a shoe compartment with lining. You’ll have compression straps and pockets throughout that help you keep everything organized and provide enough space for 7 days’ worth of clothing. The gel-infused handle makes it comfortable and the combination lock means that your items are secure.